The planet is carpeted by a jungle of gigantic mushrooms that release poisonous spores into the hot, humid air, and the mushroom jungle is inhabited by fierce and hungry dinosaurs. Battling giant dinosaurs and venomous bugs aren’t the only dangers he must face. 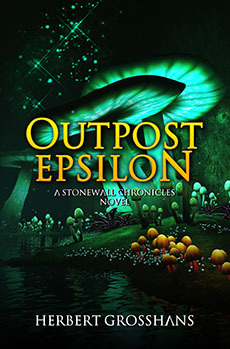 The indigenous inhabitants of Epsilon do not welcome the intruders to their world. Stonewall and his companion are captured and taken to the towering city of the Uur where an uncertain future waits for them. There seems to be no escaping their prison from the thousand feet high tower, unless they can grow wings. There is a glimmer of hope when Stonewall discovers things are not as they appear with their captors. If he can unmask the mystery and gain the trust and help of an unexpected ally escape may be possible. Terrex Stonewall shouldered his huge duffle bag, which held his meager possessions, and stepped from the shuttle onto the alien soil. Taking a deep breath, he inhaled the hot, humid air, registering unfamiliar scents and finding them not as unpleasant as he’d been told. The door of the shuttle irised shut behind him, cutting off his way back should he change his mind about this new assignment, and he moved further away as the small shuttle lifted into the air. It rose then disappeared into the low hanging clouds. Although he had been briefed, it still came as a surprise to see the giant mushrooms surrounding him. He walked slowly across the cleared area toward the enormous bubble that would be his home for the next year. He knew what to expect. Life on an outpost was not a holiday. Neither did it mean hardship, not usually. His job, as a scout for the Solar Union, would be to keep watch over this area of space and report any intrusion into the system. They did not tell him why this particular outpost was so important. Epsilon happened to be the fourth planet in a solar system at the edge of controlled Human Space. There wasn’t much here, as far as Stonewall knew. Nothing anyone would want, unless you liked mushrooms. The shrill cry of an animal hastened his steps toward the dome. Before he reached it, an opening appeared in the smooth surface of the bubble, and a man in the drab brown uniform of the Union stepped out. “Come inside.” The other man stepped back into the dome. Stonewall followed him and stood silent for a moment, breathing in the cool air. Behind him, the door closed with a barely audible whoosh. From the outside, the surface of the dome looked opaque, but standing inside, he could see the sky above and the forest of mushrooms as clearly as if the shell didn’t exist. “You even have a garden,” Stonewall observed. “Derrol Farmer. I know.” Stonewall smiled. The tall man who came walking toward them, looked gaunt, like someone who hadn’t slept or eaten for days. “So, you’re the new guy,” he said with a grating voice, giving Stonewall a tight smile. Farmer turned and walked away. “Is he always in this cheerful mood?” Stonewall asked when he was out of earshot. When they entered the Power-building, Terrex smelled the sterile air, like the air in a hospital ward. “These instruments are quite delicate. They don’t like dust or temperature fluctuations. Better put on one of the lab coats.” Peters handed him a white coat. Then they walked down a short tunnel and through a door into a large room full of computers and electronic devices. “Transmissions from the satellites circling Epsilon,” Peters said, pointing at the screens covering one wall. They displayed images of stars and empty space. “What happened?” Stonewall asked as he walked beside Peters.